Although the hubby and I have been completely entrenched this year in the company we own and operate together, we have each taken moments to 'play' and create a few things. 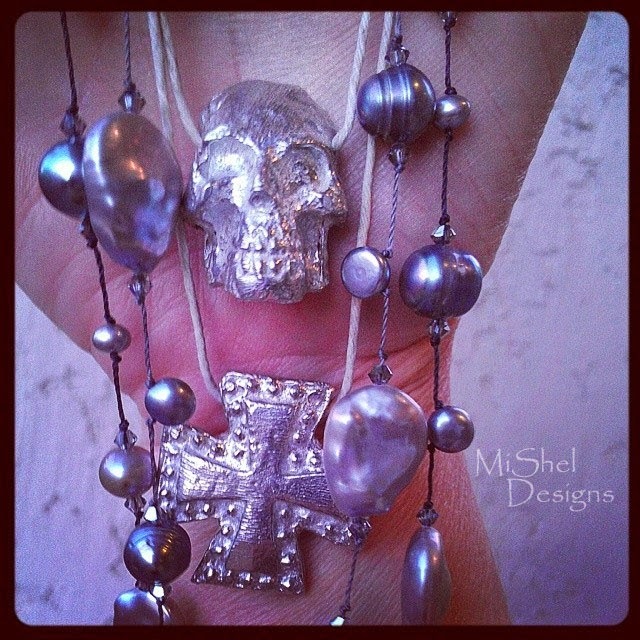 Mike likes melting pewter and making pendants and components for me to mix into my designs. 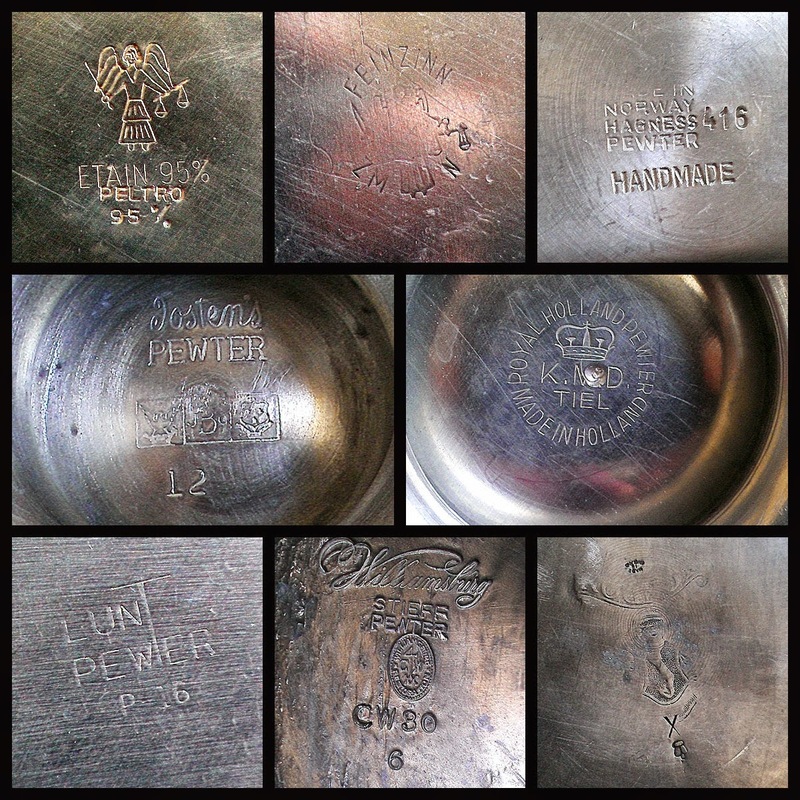 He researches the makers marks of the pieces he purchases before melting them; photographing them and logging their story; making sure the pieces he's 're-cycling' are lead and nickel free. There's some pieces he finds that are just too old, too unique or have too much history to melt down. Those have a special place of honor in his office. 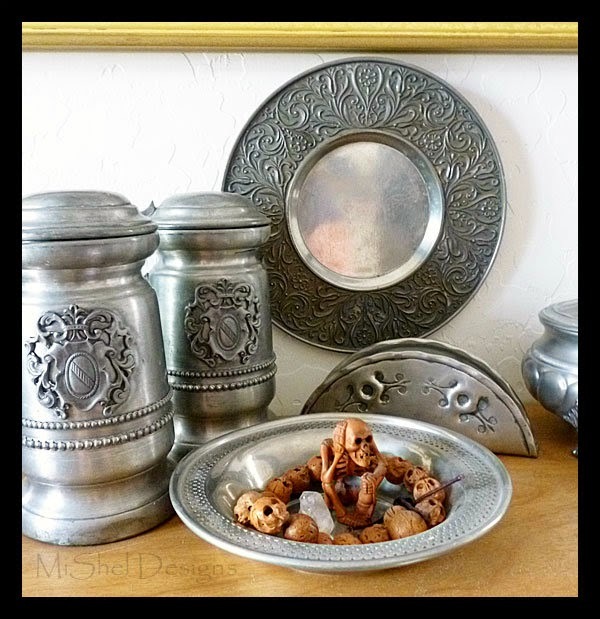 Hand-pouring pewter is the 'old-way' of creating pewter pieces. It's not as precise as other forms of casting pieces can be. It takes practice and lots of patience. There's lots of 'do-overs' and 're-melts'. Getting into the zone and pouring just the right amount of the hot, molten pewter at the exact moment is an art form in itself. We won't mention (very loudly) that he didn't start out with any traditional (or modern) melting, finishing supplies or casting items. Nope. That wouldn't be Mike. Mike: "Hey, I think I'm going to melt some pewter and see what happens. Doesn't that sound fun?" Me: "How ya gonna do that? Do you have the right equipment?" Mike: "I don't know. I got a torch. That'll work, right?" Me: "Um, I guess so. Are you melting it just to watch it melt or are you going to make it into something?" Me: "Oh Lord! Please don't burn the house down!" Mike: "I'll be in the garage." Me: "Please move my car first!" "Seriously,...."
So, after months (probably a good year or so) of playing with his torch and watching it melt and hammering it into funky shapes, having it splatter up onto his clothes and his work glasses (thank God he was wearing some eye protection!! 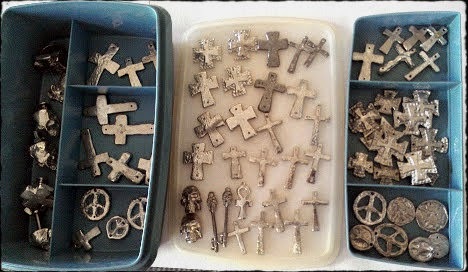 ), burning his hands, dripping it onto the carpet beneath the work bench and ruining several antique ladles (and other things), he's finally getting his technique down; working with actual 'tools' (so to speak) and products used for such things as melting, casting and creating pewter pieces. 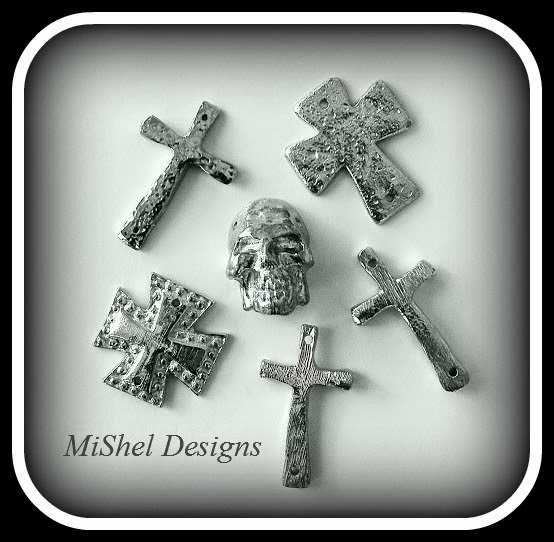 I'm partial to pieces that are 'old world' and rustic looking so Mike's style of pouring pewter and the way he gets the pieces to come out is right up my alley and fits nicely with many of the designs and ideas I have tucked away in my brain. My 'Stash' of components from my hubby! He often remarks, "Man. You sucked me right into your world! It's addicting!" Yep! Gotta love it, don't ya?!! Peace, Love and Melting, Making and Creating! This is so impressive! I love the skeleton key! That your husband just thought "I am going to give this a go" and you get to reap some of the rewards is just so much fun to think about! Yes Christine it is pretty cool. I'm lucky he's even interested in things like this!! That is SO neat how he started off with something that intrigued him and made it into a hobby he loves to do :) I really enjoy the fact that he takes pictures and categorizes what he melts down-it's important to pay tribute to the old while making room for the new! I'm working on getting him some more molds - so I'll keep you posted Kayla! Our friend Steve, who owns a dental lab, did the wax mold for the skulls he's doing and the rest were ones he either hand carved out of wood or things himself or from parts he 'put together' and them made a mold with. He's having fun and creating more pieces than I can keep up with at the moment!! Okay, that is AWESOME! 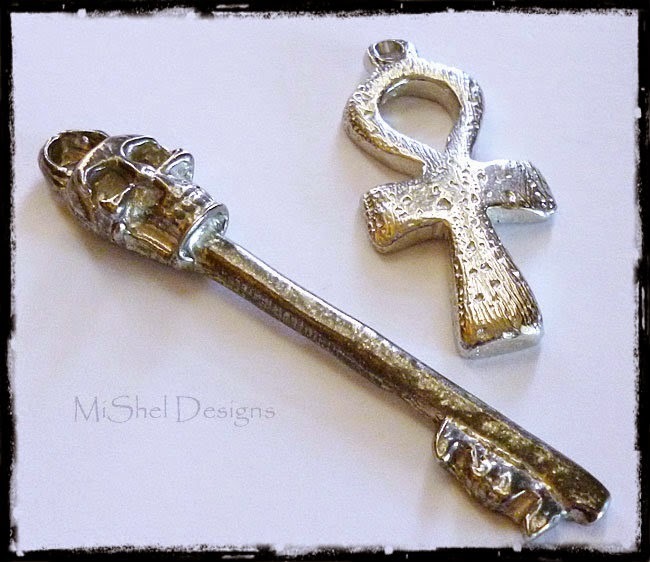 I love the look of his pieces - that skeleton key is amaze-balls - and I love that old world look, too! Has he considered selling them? Because I think so many people would be into it! Funny you ask that Brandi, because yes, he has considered selling them. 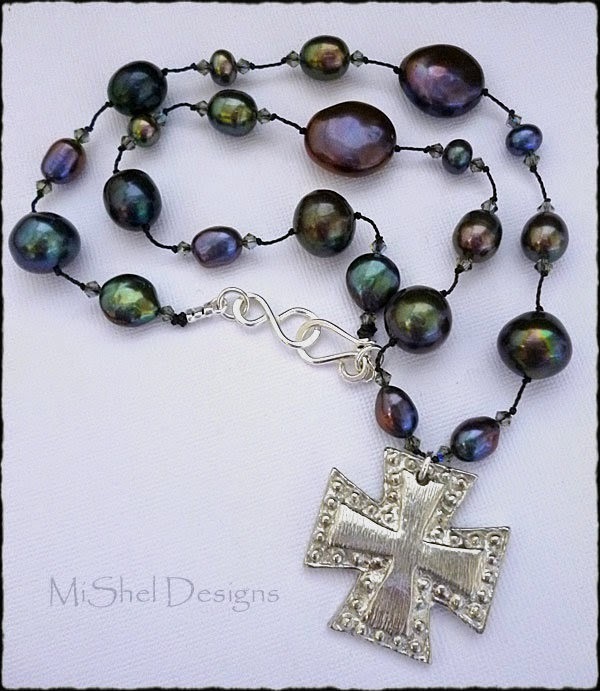 But he wants to sell them for ‘over-the-moon’ prices and I told him, “Dude, it’s pewter, not gold!” Mike – “But I put a lot of work into them!” Me: “I know sweetie, but at those prices you’re the only one who’s going to own a piece of your work! !” LOL!! ;-) I need to talk him off the ledge,….we’ll see how it goes. Watch,…people probably would buy them at his prices and then he would be rubbing it in my face! LOL!! What an awesome post this was to read today! 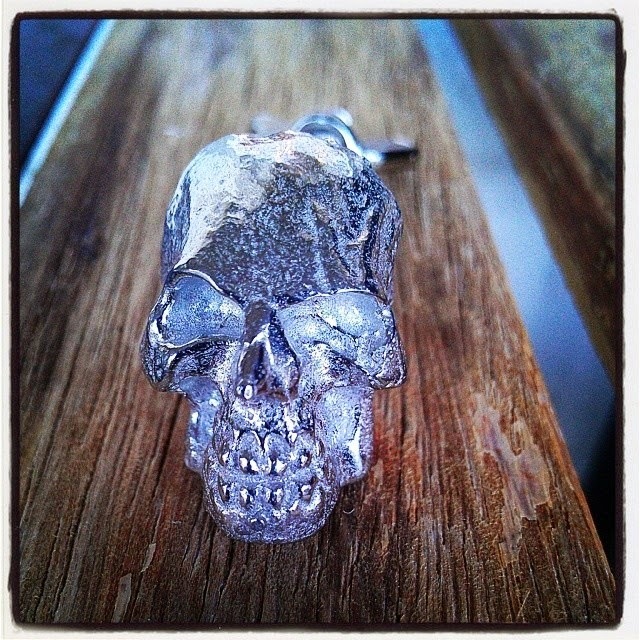 I would not have the foggiest idea of how to go about "melting" pewter and I love that he just dove right into it! 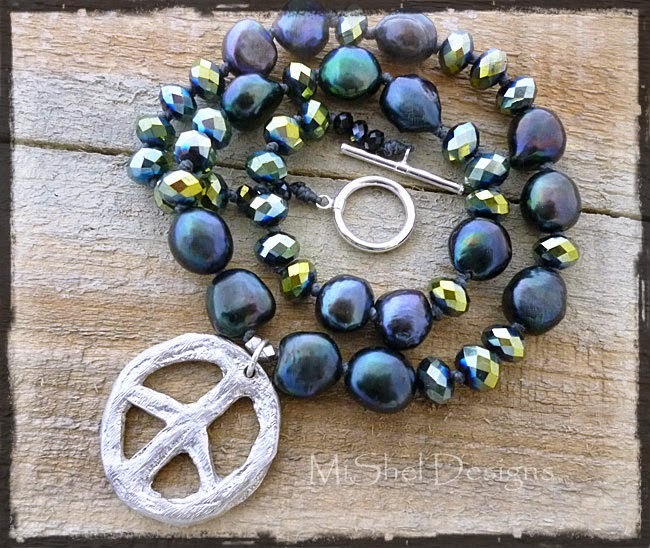 Your beautiful designs are simply made even more special with his additions ...lucky girl!